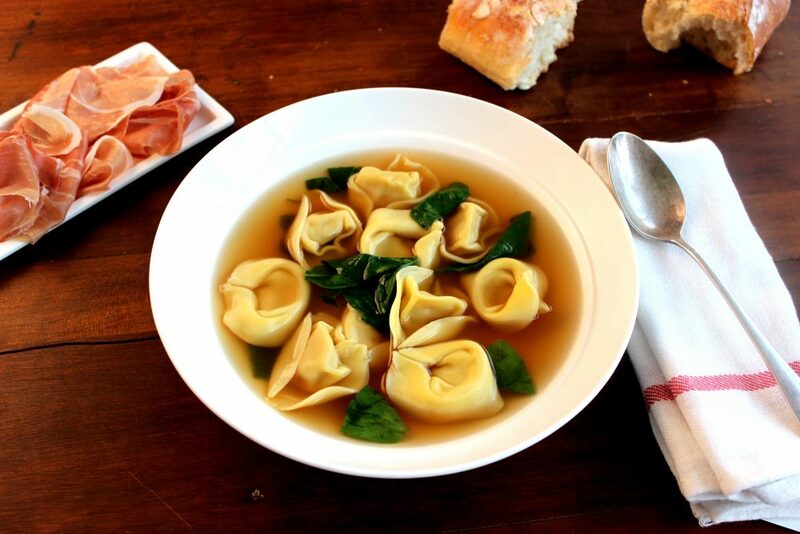 If you’re a soup enthusiast and interested in increasing your soup repertoire, try a Prosciutto di Parma Brodo. This flavorful bone broth utilizes wine, vegetables and a bone-in prosciutto leg, resulting in a hearty broth that’s perfect. The addition of tortellini and greens makes it a complete meal. To add a sophisticated touch, and even more richness, add a softly poached egg to the broth just before serving. Enjoy this prosciutto brodo with a glass of wine and some fresh Italian bread for soaking up all of the deliciousness. In a large roasting pan combine the bone, carrots, celery, onion, fennel and tomatoes. Drizzle with oil and toss to coat. Roast until lightly browned, 1 to 1 1/2 hours. Place bone and vegetables in a large stock pot. Pour wine into the roasting pan and scrape up any brown bits from the bottom of the pan. Pour into stock pot. Add bay leaf, parsley, thyme and rosemary. Add 7 quarts water to pot. Cook, over medium heat, and let it simmer. In a small skillet cook coriander, peppercorns and fennel just until fragrant. Add to pot. Allow the stock to simmer for 4 hours. Do not let it come to a boil. Skim off foam as it rises. When broth is done simmering, remove bone and vegetables with a slotted spoon and discard. Strain broth to remove seeds. Skim off any fat from the surface. Season to taste with salt. Serve with tortellini and spinach or noodles, whatever you like. Broth freezes well.